My knife skills have never provided me with any kind of bragging right. I watch with envy cooking shows where the star chef slices and dices an onion at an unhesitating pace and with laser precision. In the time it takes them to do that, I may have peeled and cut that allium in half. I chalk it up to being left-handed. Us southpaws tend to be more accident prone, processing our world and how to do things within it in a backward way thanks to our dexterity. I’d love to nail that all-important knife-rocking motion that a cooking instructor tried to teach me, and do it quickly, but I’m certain it would come at the expense of a few fingers. So while I use my snazzy Victorinox chef’s knife with pride, I realize it’s a blade unfulfilled. It also might be mocking me, ever so slightly. My rough cuts can have their charm, though. There’s no mistaking any meal of mine is homemade, thanks to the imperfect shape of the parts that make it. I’d argue in some cases it enhances a dish. Take my homemade buckwheat noodle salad, made with the intention of putting a sizeable dent in the storage vegetables taking up prime real estate in my garage. Every week, my CSA provides me with potatoes, sweet potatoes and squash as certainly as the Earth spins on its axis. And every week, my appetite for them changes. Sometimes, I'm only hungry for the sparse greens I get; the kale sweetened by frost; the bushy pak choy from the hoop house. Other days, I’m ready to tackle those overachieving tubers or crowds of kabocha squash. Last week, I had one of those days. And making buckwheat noodles their companion seemed the most efficient way to do it. It’s also therapy for me to make pasta dough, roll it out by hand and shape it. It’s a release of the day’s tensions but also the ultimate in self-care to go through the steps of making a staple I could just as easily buy at the grocery store. Which brings me back to my inefficient knife skills. 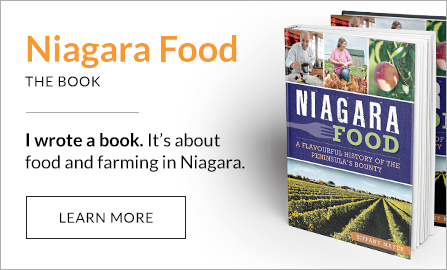 My winter veggies are grown using organic methods at Creek Shore Farms in St. Catharines. Nearly everything is planted, harvested and sorted by hand. The carrots twisted around each other and the misshapen acorn squash are never in danger of landing in the reject pile, though there are plenty of perfect specimens to fill my bag each week. My CSA is an equal-opportunity vegetable provider. So it’s fitting, then, that rather than worry about pressing the perfect homemade noodle through a pasta machine, or breaking out my mandolin for a dreamy julienne, I just used that trusty Victorinox and those slow, steady, imperfect cutting skills on these culinary misfits. My buckwheat noodle salad looked positively hand-hewn when it was finished. Still, it was beautiful in its cragginess. The noodles were crooked in places; some longer than others. The flaws in my matchstick carrots, kabocha pieces, and shredded cabbage took away from those of the hefty pasta. Chickpeas filled any remaining holes. And the sesame-peanut dressing brought out the best in them all. Let’s face it, neither my tastebuds nor my stomach would have known any better if every piece of sweet squash was just so. What I do know is my vegetable stores are getting smaller. I’m down an entire bunch of carrots, my cabbage count has been halved. I’m on my last kabocha — set apart from the buttercup with its outie belly button — now my new favourite with its creamy, caramel-like flesh when roasted. And I have knife skills that remain unenviable. 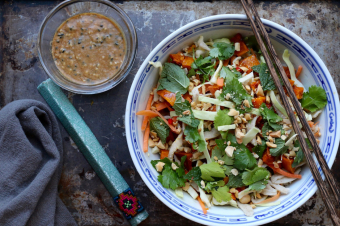 I do, however, have a buckwheat noodle salad that fills the bragging right void. Making pasta is a relaxing exercise but if you're pressed for time, store-bought soba noodles make a fine substitute. A 10-ounce package will do the trick. 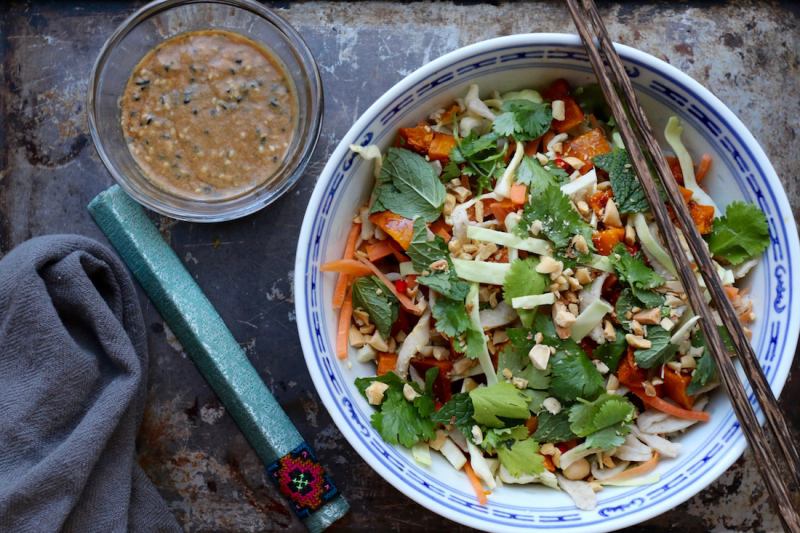 This salad can be served with the noodles warm or cold. Toss squash with olive oil and spread on a baking sheet. Roast for 20 minutes, stirring after 10 minutes to help pieces cook evenly. While the squash is in the oven, make the buckwheat noodles. Combine flours in a bowl and then form a hole in the centre of the pile and crack the eggs into it. Then add the oil, salt and water. Using a fork, break the yolks and draw in some flour, a little at time until the dough become too thick to mix this way. Dump dough onto clean, flat surface and continue kneading with hands until well-combined and it form a cohesive mass. Form it into a ball and leave it to rest 20 minutes to half an hour. Then roll out to 1/16-inch thickness with a rolling pin. Using a knife, cut noodles to linguine or fettuccini width, and cut any noodles longer than a foot in length in half. Cook 2-3 minutes in boiling water, until tender and drain immediately. Set aside. Combine all the ingredients for the dressing into a bowl and whisk together until well-mixed. Divide cooked noodles, vegetables and chickpeas into four bowls and top with dressing, scallions, chiles, peanuts, cilantro and mint. Toss gently until well-combined and serve immediately or chill until ready to serve. After roasting my squash until tender for 20 minutes, I shut off the oven and let it sit. This caused it to caramelize and enhanced its sweetness, which played beautifully off the salty and sour dressing, and heat of the chiles. When making the dressing, taste it after six tablespoons of lime juice to determine whether more is needed. I found the juiciness of limes varied so measuring the juice rather than saying exactly 4 limes are needed will ensure the citrus doesn't overpower the other ingredients. The lime juice should be noticeable but not dominant. If you don't want to make your own buckwheat noodles, use 8 ounces (half a pound) of store-bought soba instead.